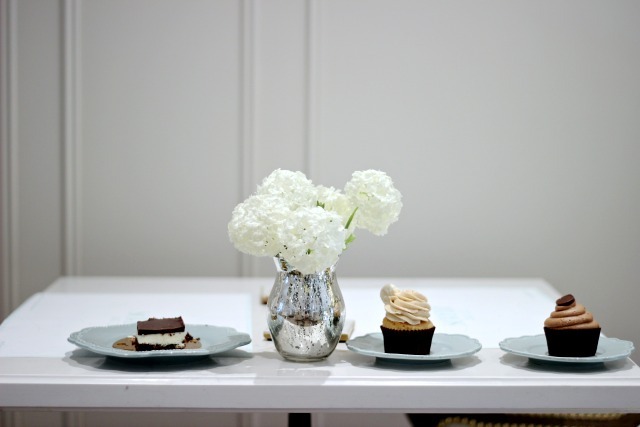 If you travel to Vaughan, a town just north of the city, and search out a petite, white, historic house with pastel blue awnings, you will find yourself immersed in a glamorous, golden, confectionery- loving world that offers the most delectable treats, light fare, and pantry goods for those with dietary restrictions, food allergies, and those who just want to indulge in a a healthier way. 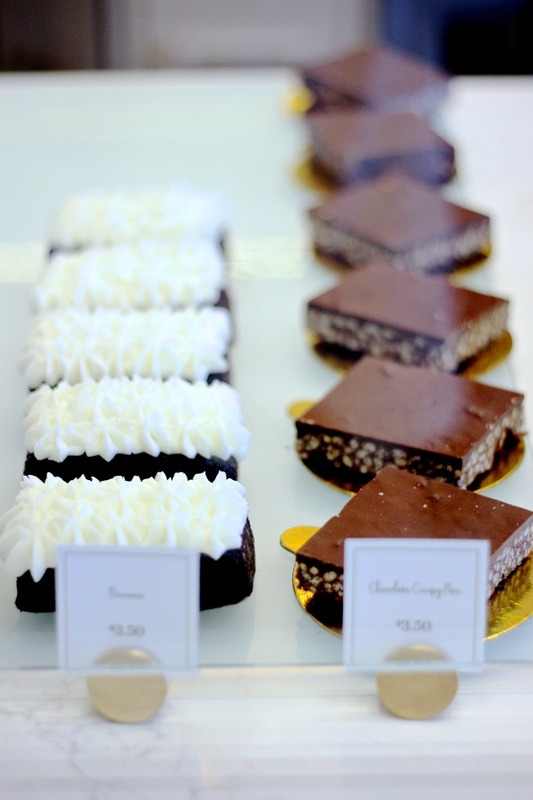 Sorelle & Co. is the newest bake shoppe and café to open up in the area that offers gluten-free, soy-free, vegan, nut-free and preservative-free ingredients. As soon as I saw their Instagram feed-- pastel and pastry filled-- I knew I had to get there as soon as possible! While the exterior is dreamy and picturesque, the interior is even more swoon worthy. Two levels of white marble tables, upholstered arm chairs fit for a queen, gold accents (including a golden staircase), and all the treats you can imagine await you. Motivated by a family with food allergies, Sorelle & Co. was dreamed up as a safe haven, as a place where you don't have to worry about what you're eating. Not only did I leave with such a warm and sophisticated experience, I also left feeling good about what I ate! I went on a lady date to Sorelle & Co. with my mom. We ordered the Caprese Panini and Quinoa Tabouleh Salad to start, but really we couldn't wait until after the food arrived to dive into the Crinkle Chocolate Cookie. The girls at the shop proudly announced that cookie as a top seller so we knew we had to try it! It was more than what you would expect from a regular chocolate cookie. So moist, so fudge-y, so much flavour and oh-so delicious! A definite favourite from the day. 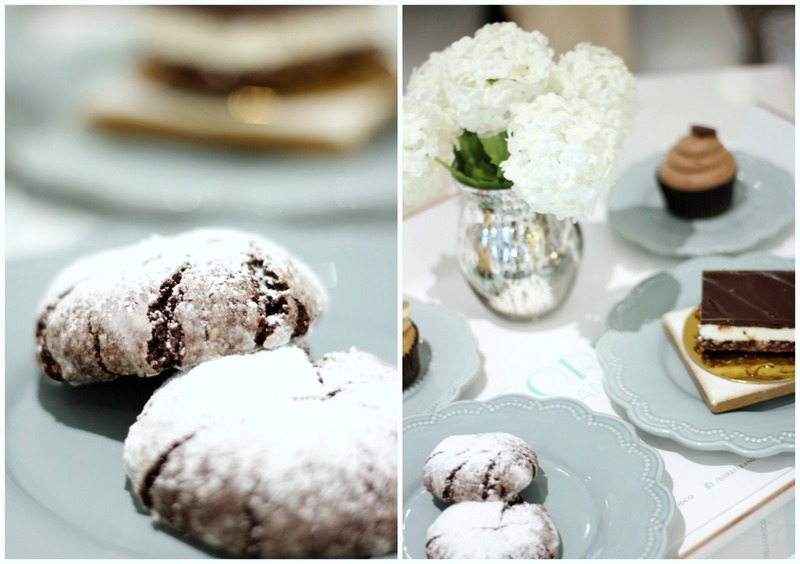 The food arrived shortly after we devoured our cookies, but really all I could think about was the other sweets! Gluten free bread and vegan cheese, and you really wouldn't have known. Food was partially consumed and it was back to the showstopping sweets. Next up were the cupcakes. A Double Chocolate, and a Snickerdoodle. Again, extremely moist and full of flavour (the chocolate more so than the Snickerdoodle). The icing was light, fluffy and exactly what you want to top your cupcake. Next up we try the Nanaimo Bar. The ladies at Sorelle & Co. identified this as their most popular treat right now, a constant sell-out, so we were excited. My mom loves Nanaimo Bars, and she was ready for it! This sweet was seriously divine! 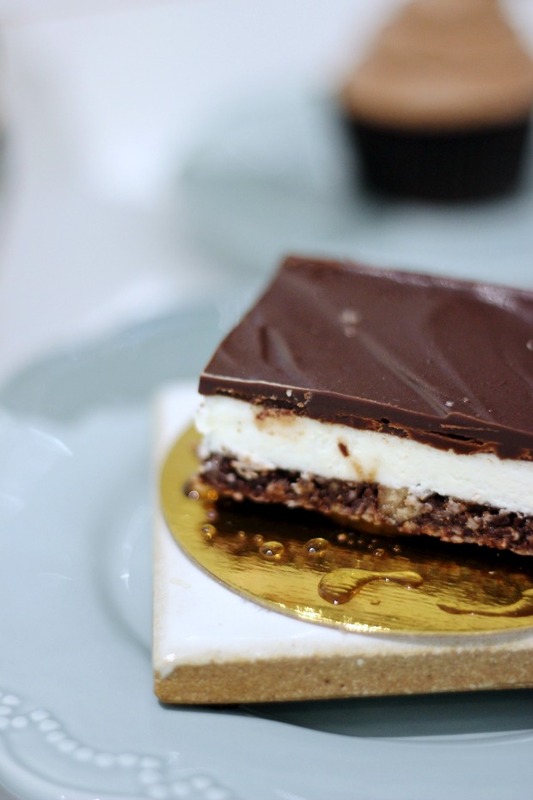 A chocolate/coconut base, a "cheesecake" centre (made with rice milk), and a chocolate top. So delicious. I can see why it's a top seller! 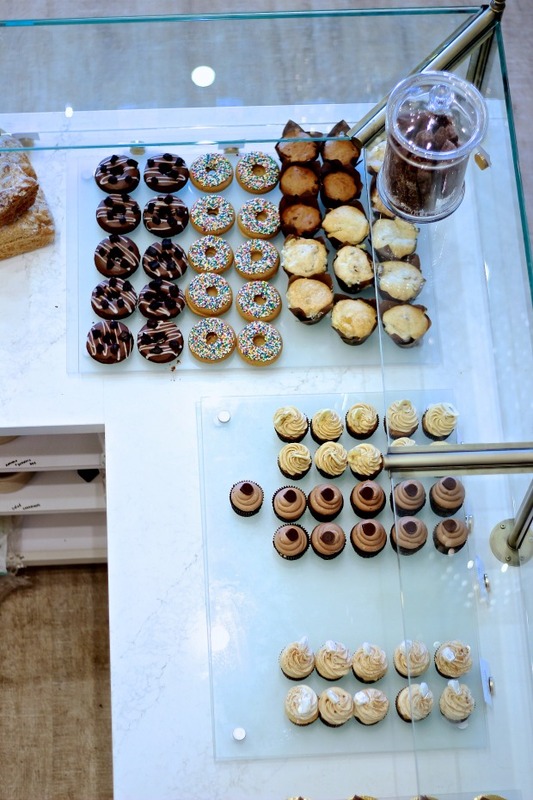 While we did sample a few of their specialties, that have taken the bakers months to perfect, there are so many other goodies I need to get back to try. There's the Ginger Molasses Cookie, the Doughnuts, Cinnamon Buns, and Protein Balls! Just take a peak at there menu. Sorelle & Co. also has a selection of pantry items to take home. Loaves of bread, roasted red pepper hummus, pesto, power seed cookies, biscotti, and more! They also offer two granolas-- Chia and Raisin, and Chocolate Chip and Banana. I was lucky enough to take home both and I have become slightly addicted to them! I don't want the bags to end. This is partially because they are totally different styles of granola than what I have been making as of late. Their granola doesn't contain oats or nuts, and has ingredients such as buckwheat, amaranth, pumpkin seeds, raisins, brown rice crisps. It's a lighter and subtly sweet change-up from my nut and oat heavy recipe. 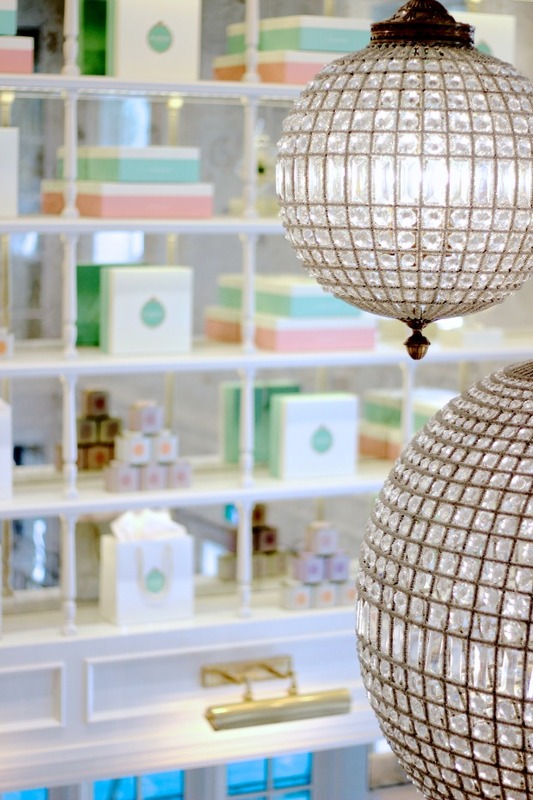 I can't say enough positive things about my experience at Sorelle & Co. The sweets are amazing, the Kombucha is local, and the decor is stunning. They truly have created a fantasy land for not only those with food allergies and sensitivities, but for anyone who loves an indulgence. Make a trip out of it and stop in to try out all the goodness for yourself. They also make custom cakes, and have a large room upstairs which would make the perfect afternoon tea birthday or bridal party! 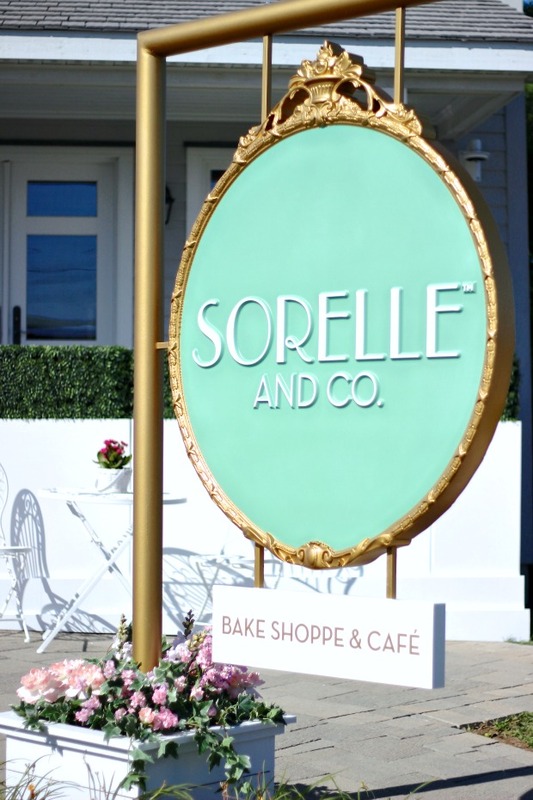 Sorelle & Co. is located at 1050 Rutherford Road, Vaughan, Ontario. While this post was not sponsored, a selection of the above mentioned items were given to me to try out and review. All opinions are my own, and those shared by my mother! Now, go visit! Ahh the shop looks so cute!! 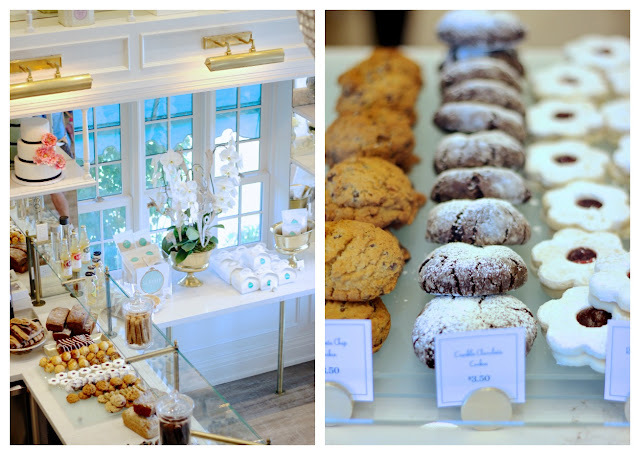 I definitely need to go there for lunch and to pick up some of those crinkle cookies! Having just got married last week, I was eager to tell everyone about this place. We had the perfect wedding, thanks to their amazing service. Most places don’t care and charge you for a lot of the things that guys at DC wedding venues were willing to help us out with.